This modern museum houses the world’s largest collection of the legendary Dutch master painter who led a troubled life and never saw his work become famous. Head to the Van Gogh Museum to see some of the works of a groundbreaking 19th-century Dutch painter. Sadly, Vincent Van Gogh only sold one of his paintings during his short life, and never dreamed of the fame he’d enjoy after his death. Here you can browse the world’s largest collection of Van Gogh’s paintings and learn about his tormented life. The museum also displays works by other master painters of his time, including Monet, Gauguin and Seurat. Vincent van Gogh was born in 1853. He started painting when he was 27 years old. His severe mental health problems led him to paint, draw and etch over 2,000 works in just a decade. In 1890 the troubled artist shot himself, and never saw the powerful effect his paintings had on the world. Among his most famous paintings are The Potato Eaters, The Café Terrace, Starry Night and his studies of sunflowers. The museum opened its doors in 1973 and houses hundreds of paintings, drawings and prints on loan from the Van Gogh Trust. The contemporary glass entrance hall was added in 2013. Highlights of the permanent Van Gogh collection include Self Portrait with Felt Hat from his early days and The Potato Eaters. Van Gogh’s work was often moody, thoughtful and detailed. The artist once threatened his friend Gauguin with a razor and out of regret cut off part of his own ear. See how Van Gogh’s once somber style became more colorful after he moved to France. You can learn more about Van Gogh at the Museum Library next door. To see more work by other 19th-century artists, visit the oval building on the lawns of Museumplein. The Van Gogh Museum is on the Museumplein, an art hub just south of the city center. There are many public transport options to get there. There are parking lots in the city center, but spaces are limited. The rotating exhibits are usually included in the general admission fee. The museum is open daily, with some exceptions. Photography is prohibited, but you can purchase post cards and posters of the collection, as well as other Van Gogh–themed merchandise. If you're chasing even more options, examine our Amsterdam things to do page. This business hub outside the city center caters to international crowds with shops, art exhibits and restaurants. Feel like a guest at a VIP party: get your photo taken with Hollywood A-Listers and world leaders in this interactive waxworks museum. See where this brave and famous Jewish teenager hid from the Nazis during World War II and recorded her world-famous diary. This palatial building full of Dutch paintings and international artifacts is the country’s largest public-funded museum. Enjoy the colors and fragrance of typical Dutch flowers, or buy bulbs and souvenirs while browsing the floating flower stalls on one of Amsterdam’s oldest canals. This lively square in the heart of Amsterdam’s cultural district offers dining and entertainment, with an array of theater, movie, music, comedy and street performances. Learn how a well-known Dutch beer is made, then drink a sample at this famous former brewery. See how the sparkling precious stones are formed, admire diamond-studded works of art and learn about Amsterdam’s historical connection to the gems. Amsterdam’s iconic square, with its cobbled stones and grand historical buildings, is a lively gathering place and venue for protests and celebrations. Enjoy a night of gambling at Amsterdam’s biggest casino: try your luck at roulette, learn a Dutch game of dice, watch a show, and enjoy a meal. This square is a major intersection for public transport and home to the Mint Tower, a significant historical landmark in Amsterdam. For at least 600 years, locals, sailors and travelers have come to this part of Amsterdam for adult entertainment in the many bars, brothels and eateries. A center for trading and socializing in the Dutch Golden Age, this square has much the same purpose today with its daily market, cafés and restaurants. One of the oldest and largest public parks in Amsterdam is a relaxing place to rest, have lunch or watch a performance after visiting the nearby museums. 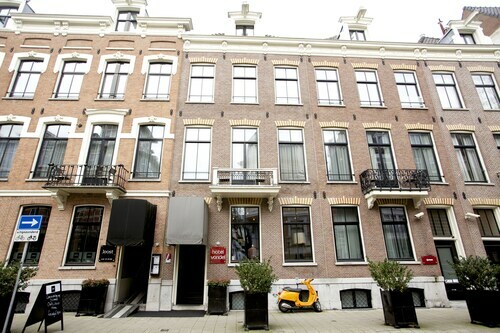 Located in Museum Quarter, this hotel is within a 10-minute walk of Vondelpark, Leidseplein, and DeLaMar Theater. Holland Casino and Paradiso are also within 10 minutes. Roelof Hartplein Tram Stop is 17 minutes by foot and Frederiksplein is 21 minutes. 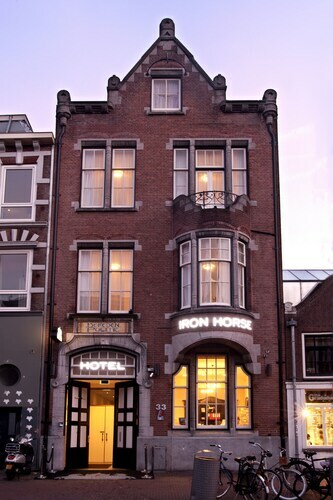 Located in Museum Quarter, this hotel is steps from Diamond Museum Amsterdam and Van Gogh Museum. Rijksmuseum and Museum Square are also within 5 minutes. Roelof Hartplein Tram Stop is 12 minutes by foot and Frederiksplein is 17 minutes. 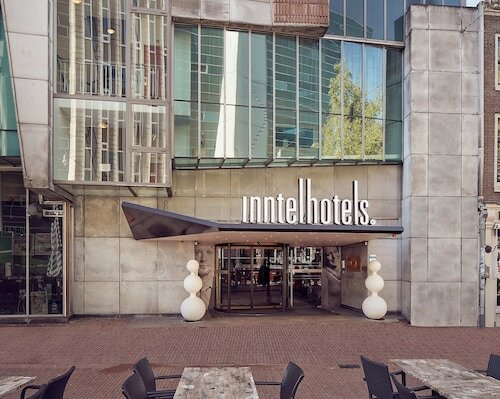 Located in Museum Quarter, this eco-friendly hotel is within a 10-minute walk of Van Gogh Museum, Rijksmuseum, and Heineken Experience. University of Amsterdam and Nes are also within 1 mi (2 km). Roelof Hartplein Tram Stop is 7 minutes by foot and Frederiksplein is 15 minutes. 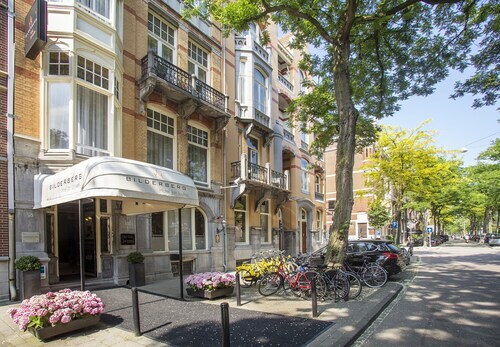 Located in Museum Quarter, this romantic hotel is steps from Van Gogh Museum, Diamond Museum Amsterdam, and Stedelijk Museum. Rijksmuseum and Vondelpark are also within 10 minutes. Roelof Hartplein Tram Stop is 11 minutes by foot and Frederiksplein is 17 minutes. 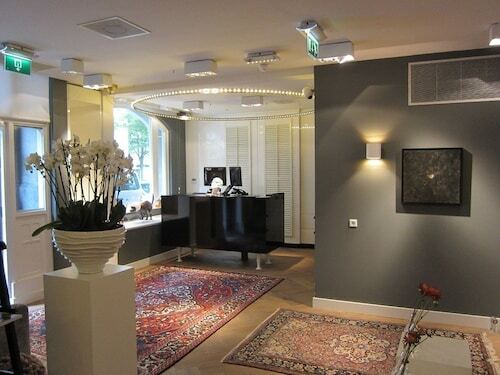 Located in Museum Quarter, this hotel is within a 10-minute walk of Vondelpark, Concertgebouw, and Museum Square. Van Gogh Museum and Rijksmuseum are also within 15 minutes. Roelof Hartplein Tram Stop is 10 minutes by foot and Amsterdam Zuid Tram Station is 20 minutes. 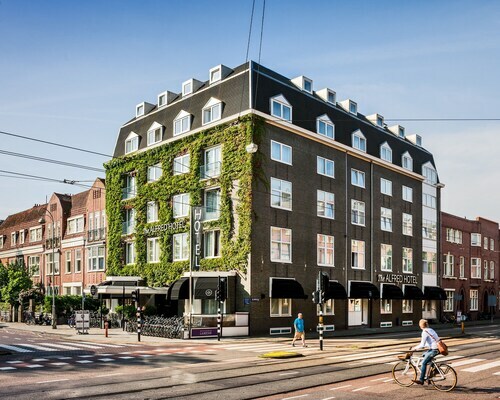 Occupying seven 19th-century mansions, Hotel Vondel is in Amsterdam's historical district. Attractions within 0.5 km (0.3 mi) include the Leidseplein, Vondelpark, Van Gogh Museum, Rijksmuseum, P.C. Hooftstraat prestigious shopping street and the casino. Located in Museum Quarter, this romantic hotel is steps from P.C. Hooftstraat, Van Gogh Museum, and Diamond Museum Amsterdam. Rijksmuseum and Museum Square are also within 5 minutes. Roelof Hartplein Tram Stop is 11 minutes by foot and Frederiksplein is 17 minutes.